One Word - Do you have yours? Have you seen any of the buzz around this idea? I’m not sure who first popularized the concept, but I’ve done this for a couple years now and it seems to be a growing trend. It’s a crazy idea for someone like me. I love lists. I love new years, new months, new school years, new journals. Always the wide open space for a fresh list of goals, vision, aspiration, ideas. And I write them all down. Lines and lines of words. I’m NOT a 1 word kind of girl. - sigh - I’ve fallen into the same trap that the majority of us do though … thinking forming a list of resolutions, (whether you write your list or hold it secretly inside), will be enough to form the discipline required to cause that list to move from ink on paper to boots on the ground. Real change happens in small steps. Incremental steps. Choices made in each, present moment, supports goals. Moment by moment decisions are easier when we don’t have an ocean of lists to recall and stay committed to. … what if we each started now, asking God to give us 1 word. Each of us, our own one word. A word for this new year. A word, (or short phrase), to set our hearts and our minds to. to be pursued, or realized, or understood, or lived, or accepted, or owned, or believed. It will be different for each of us. Personal. Individual. He has unique, individual & beautiful ideas for you. This year. in front of your eyes everyday. 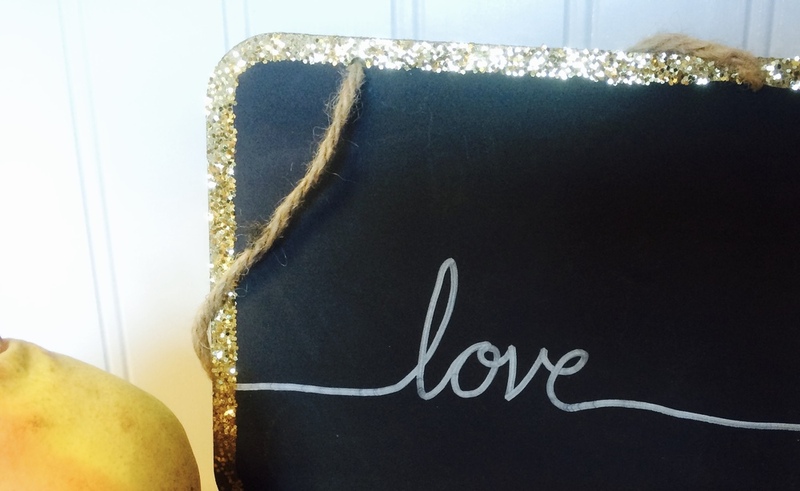 I chose to use this little chalkboard with room for only one word, (maybe 2), to write that word and hang it close. Maybe you’d like to find one too. Or write it on paper. Or stitch it in scraps. Let it swing and sway and wave like a banner where you will see it. Share it with someone. Accountability and encouragement are powerful tools. Search God’s Word, THE Word, for a verse that you can lean into and take ownership of that word through. Pray your word, study your word, speak it and write it and find it and be present with it. Let it become present in you. That one word will be easier to ponder, consider, remember, and use as an anchor when pressures push and feet feel unsteady. One word is much more doable than many. It will work it's way into unexpected places and I promise you will be amazed at what God shows you and how you grow this year with ONE, simple, God-whispered-word in front of your eyes and in your heart everyday. Would you share your one word here? I’d love to hear what He’s speaking to you! Newer Post5 words - 26 times.